The end of August Bank Holiday is your last chance to make the best of the British summer weather on a long weekend break before the Autumn sets in. So why not make the most of the extra long weekend with a cottage self catering break on the coast or in the wonderful countryside. We have over 15,000 self catering cottages, apartments, lodges and chalets that would make a perfect get-away this August whether you are looking for a budget break or a 5 star luxury stay? If you are looking for some inspiration for this August Bank Holiday check out the some of the self catering accommodation below - including cottages, apartments and lodges - which you can view, check availability and book online. If you want to get away this August bank holiday it doesn't have to cost the earth, whether you are looking for budget or luxury accommodation, there is some great self catering. 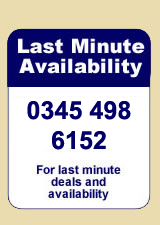 To get some great last minute Bank Holiday deals and latest availability we recommend calling 0844 847 1143 for a selection of cottages, apartments, lodges and more. If you are not sure whether to start your August Bank Holiday cottage and self catering search here are a few favourite cottage holiday locations, from popular counties to wonderful locations in England, Scotland and Wales, to get you started. Entertainment over the Bank Holiday? OK, for many just a break to get away from it all is all they want on a Bank Holiday. But, if you want to be sure that should you wish to explore and see things whilst away it is worth checking out our Holiday Attraction finder where we have listed things to do and see including historic houses, castles, cathedrals and garden (we are assuming you can rule out the zoos and theme parks). See Holiday Attractions. In addition check out our Sporting and Social Events, Festivals and Events, Gardens to Visit and County Show Guide for lots to do and see across the UK this Bank Holiday.